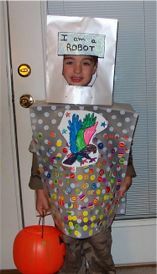 For over two months my grandson (5 year old brother of the 4 year old quadruplets) has been telling his mother (my daughter) that he wanted to be a robot for Halloween. I never heard a word about any of this until last Saturday when he was at our house and saw something about Halloween on TV and informed me that he was going to be a robot for Halloween. 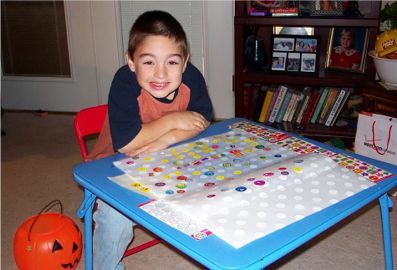 My heart sank – I knew that October 31 was a festival that my daughter and I would be attending (no time to make a costume that day) and that I’d be getting home around 6:30 – and Jacob would already be at my house for the weekend. Well, we found a couple of great bags at Walgreens (one on sale for $1.00 and the other for $4.95) and I got him a pkg of stickers so he could decorate it. 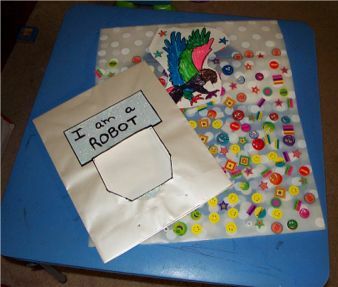 He spent most of the day decorating with the stickers, then found an “American Eagle” picture he insisted on coloring to put on the robot costume. Here’s a picture of Jacob with his “work in progress” and then the “finished” costume. And now — TA DA — Jacob in the costume ready to head out for trick or treating! 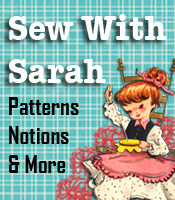 The whole point of this post is to let you know how to get your kids started in the creating and crafting mode — and later on perhaps into the sewing mode as well!